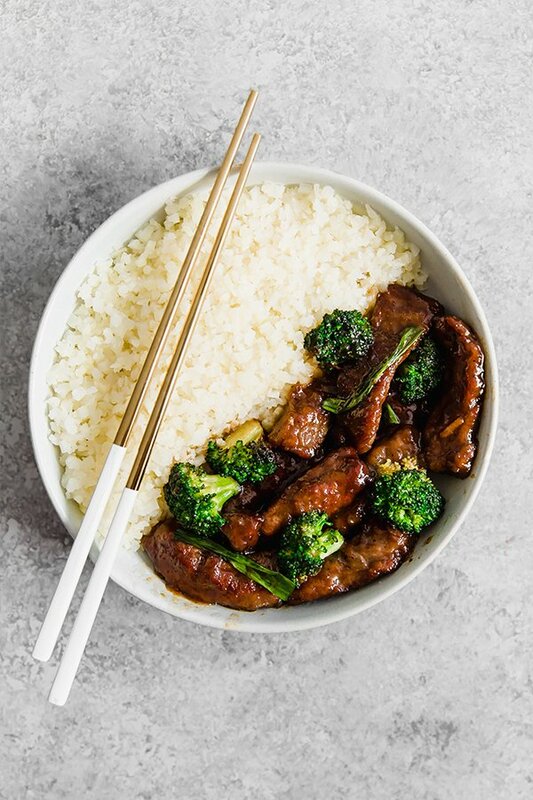 This Mongolian Beef Stir Fry is flavorful, simple, and filling! It’s soy free, paleo, whole30, and AIP compliant. Have I shared here before that I never really ate beef until I was in my 20’s and married? Crazy, right? I had a fast food burger here and there as a kid, but I never had steak or pot roast and maybe I had stew meat once or twice. When I first tried flank steak to make a stir fry, it basically rocked my world. 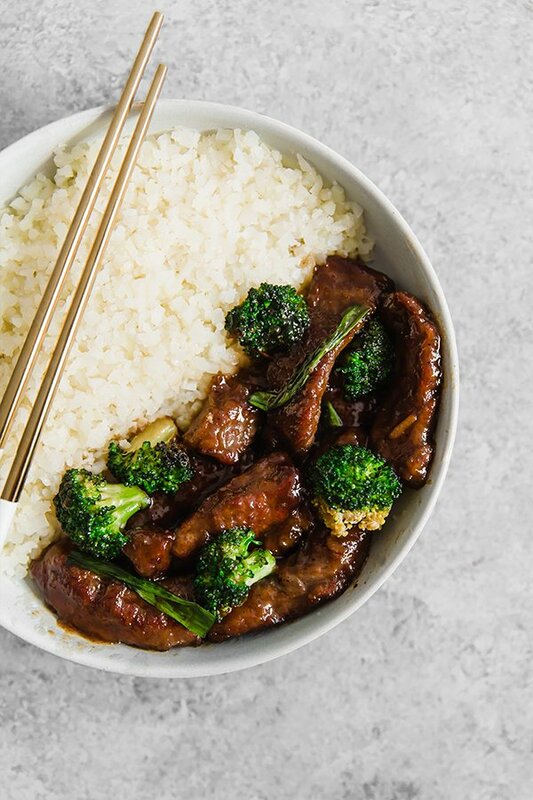 Flank steak is amazing, and this Mongolian Beef is basically the perfect stir fry! Mongolian beef is typically made with corn starch, soy sauce, and served over white rice. It’s a very savory and all around delicious meal, but it’s not a natural gluten-free or paleo dish. However, you can easily tweak the classic to be paleo, AIP, and whole30 with just a few simple swaps. And I promise… you’re not going to know the difference! I find flank steak is the best option for Mongolian beef. Coconut aminos is a soy-free soy sauce substitute that can be found online and in health food stores. The garlic and ginger give this a little bit of kick without using nightshades. 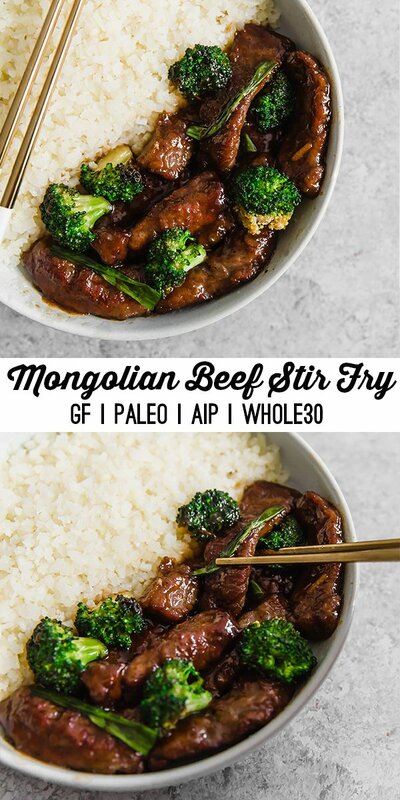 It’s an amazing flavor combination in stir fry! 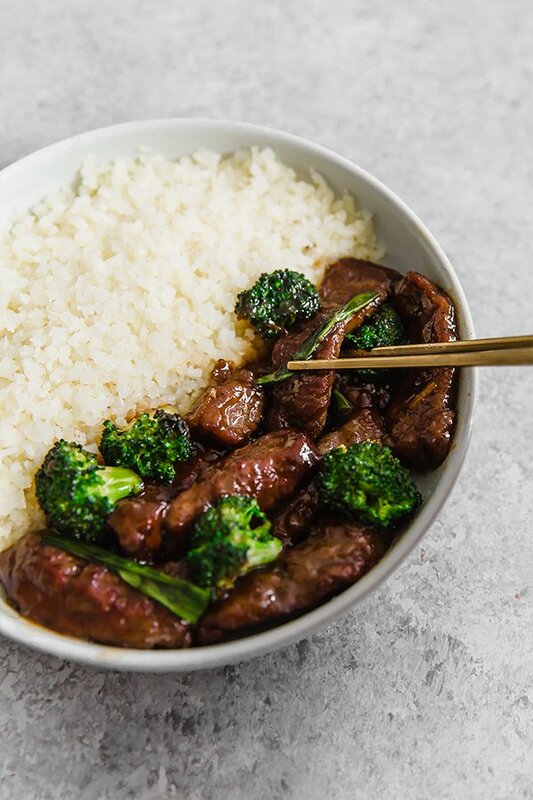 Broccoli pairs well with Mongolian beef, and cauliflower rice is a great rice substitute! This Mongolian Beef Stir Fry is a flavorful and filling dish. Using a large deep skillet, heat 1-2 tbsp of avocado on medium heat. Add the broccoli and add a pinch of salt and pepper. Cook for 6-7 minutes or until fork tender. Remove the broccoli from the pan, set aside, and clean out the pan. Prepare the flank steak by adding salt and pepper to both sides, and using a sharp knife to slice against the grain into about 1″ bite-sized slices. Add the arrowroot starch to a bowl and add the steak slices, coating thoroughly. Using the same pan, heat 2-3 tbsp of avocado oil. Once the oil is hot and shimmering, add half of the steak slices. Cook for 2-3 minutes on each side, and repeat until all of the steak is cooked. Set aside. Add the garlic and ginger to the pan and cook for 1 minute. Pour in the coconut aminos and chicken broth, and add the steak back in and cook for another 2 minutes to allow the sauce to thicken. Add the sliced green onion and broccoli back to the pan and cook for another minute. Yum! Reminds me of PF Chang’s Mongolian Beef. I’d like it to be a bit more crispy, so need to work on my technique. Thanks so much! Is there a substitute for arrowroot starch? I can’t seem to find that and any nearby stores. Made this tonight, and it was absolutely delicious! Thank you!! Would this freeze well/reheat well? Finally tried it tonight. It was fantastic! Thank you so much! So glad you liked it!! Thanks, Anna!! Great recipe!! !My family loved it! !